Make a new friend…become a Buddy! Ever feel like you want to make a difference in another person’s life? Well, you can if you’re a Buddy! You can give individuals with special needs the gift of friendship and baseball by volunteering as a Buddy. Working one-on-one with our players will warm your heart and spread joy all around! Our Buddy system pairs each player, with a volunteer helper that remains with them the entire season. 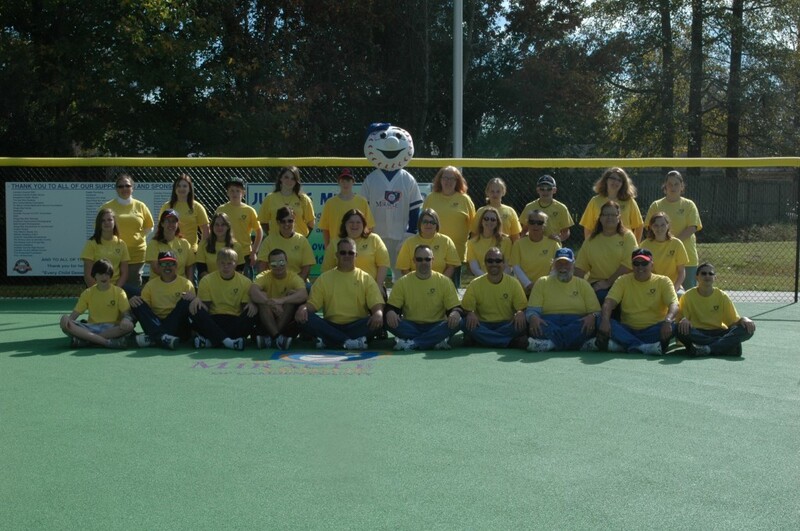 Buddies are expected to protect the Miracle League player at all times. When a hard hitter is up at bat, buddies are to step in front of the Miracle League player for protection. Always allow the Miracle League player as much freedom as possible to play his/her game and position. Assist the Miracle League player according to their needs. Arrive at the field 15 minutes prior to game time. Notify the Miracle League Buddy Coordinator (Tina), or your coach, at least 24 hours prior to game time if they will not be able to attend the game. Be properly dressed in the Buddies t-shirt. Demonstrate high morals and integrity on and off the field.Can I receive credit for service hours? We have several volunteer positions available including Buddies, Coaches, Umpires, Team Moms, Concessions, etc. Individuals must be at least 12 years old or older to volunteer and to be a Buddy. Buddies that are 12 or 13 years old will be assigned in our first game (6:00 pm). Buddies 14 and 15 will be assigned in our second game (7:15 pm). Buddies 16 and older will likely be assigned in our last game (8:30 pm). We understand that the registration process is time consuming and to ease the administrative burden, we only require returning volunteers to submit the complete registration package each Spring. During the Fall registration period, we ask that all returning volunteers fill out a Camden County PSA Waiver form and attend the registration meeting to update or validate their registration paperwork that we have on file. All new volunteers must complete the ENTIRE registration package. **NOTE** Both of the registration forms have been updated to include the required Camden County PSA Waiver Form. You do not need to download it separately unless you are registering for the Fall Season. When submitting the Georgia Background check form, please include a photocopy of the front of your driver’s license. This will be used by the Kingsland Police Department for processing. There is no registration fee for volunteers. Buddy shirts will be provided to each Buddy free of charge.